The purpose of this document is to describe the level of compliance of Team System 2008 Team Foundation Server with Open Web Application Security Project (OWASP). Specifically it identifies how the OWASP Top Ten 2007 threats are handled by the security design and test procedures of Microsoft and the Team Foundation Server product team. What are the OWASP Top Ten? How does Team Foundation Server address the OWASP Top 10? The Open Web Application Security Project (OWASP) is a worldwide free and open community focused on improving the security of application software. The OWASP Top Ten provides a powerful awareness document for Web application security. The OWASP Top Ten represents a broad consensus about what the most critical Web application security flaws are. The current version is the OWASP Top Ten 2007. Visual Studio Team System 2008 Team Foundation Server (TFS) is an integrated collaboration server for Visual Studio Team System. It combines team portal, version control, work item tracking, build management, process guidance, and business intelligence into a unified server. It allows everyone on the team to collaborate more effectively and deliver better quality software. The primary aim of OWASP Top 10 2007 is to educate developers, designers, architects and organizations about the consequences of the most common Web application security vulnerabilities. The following table provides a summary of the vulnerabilities included in OWASP Top Ten 2007. Injection flaws, particularly SQL injection, are common in Web applications. Injection occurs when user-supplied data is sent to an interpreter as part of a command or query. The attacker's hostile data tricks the interpreter into executing unintended commands or changing data. Team Foundation Server uses the Microsoft Security Development Lifecycle, or SDL, to minimize security-related vulnerabilities in the design, code, and documentation of the product. This process helps to detect and eliminate vulnerabilities as early as possible in the development lifecycle, as well as reduce the number and severity of security vulnerabilities and improve the protection of users’ privacy. Secure software development has three elements: best practices, process improvements, and metrics. Microsoft has implemented a stringent software development process that focuses on these elements. The Microsoft Software Development Lifecycle (SDL) is available to the public as process guidance on the MSDN Security Developer Center. The following table describes how the SDL maps to the OWASP Top Ten 2007 vulnerabilities. Identified during threat modeling in SDL Stage 4: Risk Analysis. TFS can be configured to use SSL encryption on front-end and backend connections. For more information, see Team Foundation Server Security Architecture. Starting with the Trustworthy Computing (TwC) directive of January 2002, many software development groups at Microsoft instigated “security pushes” to find ways to improve the security of existing code. However, the reliable delivery of more secure software requires a comprehensive process. To that end Microsoft defined four guiding principles to guide the creation and support of more secure software: Secure by Design; Secure by Default; Secure in Deployment; and Communications (SD3+C). The Security Development Lifecycle (SDL) brings these principles to life, by integrating them into every step of the software development lifecycle. 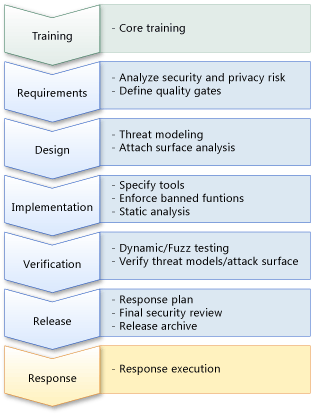 The Microsoft Security Development Lifecycle (SDL) is the industry-leading software security assurance process. A Microsoft-wide initiative and a mandatory policy since 2004, SDL has played a critical role in embedding security and privacy into Microsoft software and culture. Combining a holistic and practical approach, SDL introduces security and privacy early and throughout the development process. Every shipping Microsoft product must be approved by the Secure Windows Initiative (SWI) team and go through a process of review and registration in a central repository. Visual Studio Team System 2008 Team Foundation Server SP1 has achieved compliance with Microsoft’s Security Development Lifecycle (SDL).